The technology is so advanced the crew always escape via inverse tachyon metroside cliche beams which, Lo and behold, a major character just happened to get a grade ‘A’ (never a ‘C’) in at ‘Treknobbable class’ at Starfleet Academy. So, my plan was to have an emotionally overwrought English ‘Captain’ on a tin can of a starship flying in the face of the Federation on a mission set firmly against the greater good with a Catholic on board and a crew holding everything together with sticky tape whilst, somehow, still being Star Trek. And why not? Whether I succeeded, of course, is another matter. Oh yes, I am aware that almost certainly Daedalus class starships were not fitted with transporters. But Star Trek isn’t Star Trek without a transporter. 'Star Trek' is a trademark of Paramount Studios and all copyright and intellectual property rights pertaining to 'Star Trek' remain with Paramount. This story is fan fiction only and not intended for commercial use, selling, re-selling or distribution at any cost to the reader. This story may be distributed freely but must remained unchanged (others have edited my text in the past!) and the author acknowledged. I slaved over a hot 286 for this so I want a little credit. Thanks in advance. Enjoy. By the way, I reserve the right to adapt this story if the Birth of the Federation series does fly. I was working on the assumption it wouldn't but it's the remaining rumour at the moment 23/12/2000. To put things in perspective, this story is set in the year 2224. Made history today. I put the Jefferson into orbit around a planet that does not exist. We've been exploring the edge of the Cirrus system and found a planet previous survey's failed to locate. Captain Lim is quite perturbed. I can understand why, I think. I mean, either we've got whole planets just appearing out of nowhere or our survey missions are hopelessly inept. Scans of the planet have shown the remains of what looks like an old USEFP starship that has crash landed on the planet. It's clearly a very old ship and there are no signs of survivors, not likely even given the time it's been there. The planet's a dead rock in space. No-one, however, can find a record of a ship passing this way since the Victoria's survey of this sector only six months ago. 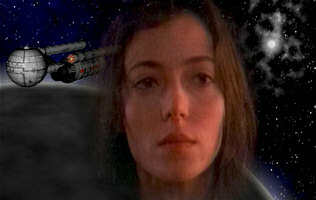 A survey team is being sent down to the planet led by Lieutenant Anne Walker. I'm worried. Something feels wrong here. I wish I was going down too but I'm navigation, of course. "What do you... Good God. Sensors!" "Mark, did you see anything?" "No sir. When I looked up she'd just vanished." "Full sensor sweep. Comms, contact that team, get onto Starfleet. Transmit all sensor logs." Starfleet Operations - Admiral Ononogu Stardate 2311.9 to Captain Lim of the USS Jefferson. We have reason to believe your ship in grave danger due to a spatial anomaly detected by Deep Space Probes. You are ordered to leave the sector immediately and return to Starbase 5 for debriefing and crew re-assignment. We repeat, you are to leave immediately due to extreme risk to you and your crew. A properly equipped science vessel with experienced officers is already proceeding to your sector to begin a full search for your crew members. In the meantime, you must leave the area immediately. "Captain, with all due respect, we can't just leave them!" "We are under orders Ensign. A science vessel is on it's way." "But we're here! It'll take a week to get here. They don't have the oxygen for that!" "They don't have the oxygen anyway. We've been here for three hours, they had supplies for two. They're dead unless they've got that ship's life support operational. We are under orders for our own safety. Now set course for Starbase 5." "Noted. Now plot that course, that's an order." "Dismissed. Get off my bridge. We are under orders to leave this sector. I'm not having you endanger this ship and it's crew." Starbase 5. Deck G. Crew Quarters R&R, Room GA12. Mark awoke. He curled up into a near foetal position. The pain was crippling him. It had been hard enough knowing Anne was not going to marry him, but it was another level of pain to have lost her completely. Life without love was agony but love without life was killing him. Mark closed his eyes wishing he could get back to sleep. These past few nights he had been desperately tired but anxiety made sleep hard. It was an impossible situation. It was not as if the survey team were lost forever. They could survive on board the crashed ship if life support could be activated, a likely possibility. But without food their time was limited. But he could do nothing to help. The Jefferson had been recalled and the crew given shore leave and reassigned to different ships. In three days time he was boarding the Coventry exploring the other side of the Alpha Quadrant. It seemed Starfleet were determined to rip his heart to pieces for him. He opened his eyes. His mind was too active to sleep. He punched the pillow, the anger taking over him. He punched again and again and again, seeing Admiral Ononogu's face again and again and smashing it pieces before collapsing into tears. Again. It was so hopelessly unfair. No-one cared about the survey team, well, one member, more than him but that counted for nothing, even for feedback. Her parents were entitled to information from Starfleet command as was Anne's Earth based fiance, Gary. Rumour had it he was shipped on the ship that had gone to search for the team. But Mark was just an interested party who had no right to know, no right to feel. He was under orders to quash his feelings and report for duty to plot a course literally as far from his beloved as current technology would allow. Mark screamed, yelling at a God he did not believe in at injustice of it all. There was a beeping from the vidlink on his dresser. Mark gulped in his emotions. Part of him leapt. This might just be news. He wiped his face with the bedsheets and checked the clock. Whoever was calling was not communicating via subspace from Earth. He hit the video phone. It was Phil, 'Mr Frosty' from the Jefferson's science deck. "Mark." The American started. "I've got data on the survey team." "Phil, you're an angel." Mark responded, realising he looked a total mess. But then, it had been Phil who had called him. "You won't like it." He was warned. Mark listened. Computer graphics appeared on the small monitor as Phil spoke and as Mark's eyes widened. The rest of the night was spent pacing up and down kicking things, smashing thngs, screaming and crying. And thinking. Through the avalanche of pain, frustration and raw passion that consumed him, there was a cold, ruthlessly logical component thinking the impossible. At 4.00 GMT Mark was on his laptop connecting to the Starfleet database looking up critical data. At 5.30 Mark was dressed in Uniform and on the comm link. Starships had a maximum speed of around Warp 5.2, not yet fast enough to just hop back to Earth for a bit of R&R and colonies were still settling in, conditions rather primitive. So the crew of the Jefferson were largely stationed on Starbase 4 for their break before the Coventry picked up it's new crew. That made finding and shifting through potential mutineers easy, the ones who had protested the loudest (in writing) at the abandoning of their comrades. The results were surprising, yet by 4:00PM that same day a very tired Mark had them all in his quarters; Soogen, an Indian Catholic who tried to take their case to the almost completely ignored Vatican, Max, the Australian engineer who had been seen to get angry for possibly the first time in his life, Jennifer, a pretty medical officer who went on strike in protest and been demoted as a result, and Phil who to Mark's surprise was willing to discuss his mad plan. Mark put down his tea on the 'living room' table. "You know why I've dragged you down here." He said. "Phil's got news on the survey team, news I know is going to shock you. Phil." The scienc officer stood. Funny considering that he was all but an inch taller than Mark that Phil always seemed so much taller than he really was. Phil flipped around his laptop showing the X-Planet as it had come to be known. "There is going to be no rescue of the survey team." He told them. "The Federation has abandoned them." It was a statement of fact. Phil never voiced opinions only what he considered facts. What he said he meant, unless he was being sarcastic. "You can't be serious." Jennifer cut in. "They promised us a ship was on it's way." "Oh I'm willing to bet there's a ship all right, a Lancaster class heavy cruiser armed to the teeth, but no science vessel. Look at the stars." Everyone peered at the computer display. "These are images from the Jefferson's scanner logs. Now keep your eyes on the stars." The planet vanished. The stars shifted forming new constellations. "I don't get it." Jennifer said. "We're looking at another part of space." Soogen noted. Evidently he got it. Phil nodded. "Exactly. The reason the Planet vanished is because it was, in one sense, never in Federation space to start with. We have a gravitational warp of some kind folding space over so the planet, in it's orbit, slid over the fold, sliding into our space briefly before slipping back into it's point of origin. The planet is no longer in Federation space. It's physically not at the co-ordinates we found it." "So can we locate where it is now?" Soogen asked. Phil nodded. "That's why you need to look at the stars. It takes bit of work with a computer and lot of hunting through history but I was able to trace the constellations we had to those seen by numerous starfleet vessels in the early 22nd Century." He hit a button. The display shifted again to display a distant sun and a small red planet. "And that's why there's going to be no rescue mission." Phil assured them. "No ship is going to risk another war with the Romulans by crossing the borders right beside Romulus. That's why we were called back. Smarter computers than ours spotted what had happened and we were dragged away before we crossed the threshold. We've all been reassigned, split up so we can't talk about it. The Federation had a back door to the Romulan Empire. They want it guarded, they want it secret. A week or so from now and the telegrams will be sent out saying a survey ship failed to locate the survey team and they are likely dead." "Which could be true with no oxygen." Max pointed out. Mark shook his head. "The ship that crashed was probably a Pioneer class starship, damaged during the Romulan war. Oxygen regeneration would not be hard to start up along with water recycling. Assuming a section of the ship is air tight they could last for months. "But not without food." Jennifer pointed out. Mark nodded. "So someone's got to rescue them." He said, matter of fact. Now all eyes were on him. "You've got plan." Soogen noted. "I have an idea." Mark replied. "Trouble is, it means going AWOL, it means stealing, it means effective mutiny and court martial. I'm not asking any of you to do this and this is probably a stupid idea anyway but it's all I can think of. Phil's done a feasibility study and it could just work. But, before I even start to tell you, if we could get them back, alive, without starting a war, would you do it, even at the cost given?" "You know that answer already or you wouldn't have called us here." Jennifer said. "Look, you've been probing us all day. Assume we're in for the moment." "You won't shop me even if you disagree?" Mark asked. "I'm serious. Because I'm going even if no-one else is." Silence. There was nothing to say. Mark knew he'd raised the stakes too high too early. He had to let them to keep them with him. "All right." He breathed. "We can get to the planet via the space fold or whatever it is. Phil is certain that if a Planet can transverse the fold a starship can. The only thing is that we can't use impulse engines or we bend the fold and shoot out in the middle of nowhere, probably in a giant black hole. All we need is a ship that can sustain us at a minimum of Warp 3.5 and get there within four weeks, just enough time before starvation causes permanent damage." "Yes, but where do we get a ship from?" Jennifer cut in. "The only vessels that fast are Starfleet and they're not going to hand one over." Mark nodded. "So we borrow one." That caused Pandemonium. The court martial already mentioned now became real. "Er, Mark." Max cut in, over the protests. "Starfleet doesn't have that many ships. You've got security codes, a crew to deal with, not the mention the fact that you need more than five people to run a starship." Again, Mark nodded. "All true. For current starships. Phil." Another button was pressed. A ship appeared on screen. Eyes widened in disbelief. "A Daedalus class?" Max blinked. "Er, I don't know my starfleet history but weren't those things discontinued fifty years ago?" Jennifer asked. "Thirty five actually." Mark replied. "And that's the USS Galahad, one of the last built so it's the most up to date of it's kind." "But there aren't any of it's kind." Jennifer retorted. "They're discontinued." "But not destroyed." Soogen noted. "I get it. You're thinking about the Mutara scrap yard." "Where old decommisioned ships are stripped and shut down ready for salvage for spares as required. I've been careful about the ship I've chosen. She's old, she's primitive. The weapons and commodities will have been stripped out but we can cold start the MAM reactor via the buzzard scoops, Phil is certain he can boot up the computer, it's technology was out of date before it was decommisioned so nothing fundamental has been ripped out and the nuclear core is still active so impulse will fire almost immediately." "Yeh, but those old ships had a reputation for unstable reactors. She could blow when we fire her up." Max interjected. "I've checked. It's a risk, but then this whole crazy plan is a massive risk. However, all Daedalus class vessels were recalled for reactor checks in the 2170's. Any faults would have been fixed them." "Those ships were small." Jennifer said. "There won't be much room." "The reactors take up half the ship space." Max confirmed. "But there'll be only five of us." "So you're inviting us to meet our creator?" Soogen suggested. "Probably." Mark accepted. "But if we don't try five others will. It's mad, bad and dangerous, literally. Who's with me?" Mutara Nebula ship yards, four days later. Mark blinked, the last sedative Jennifer had sprayed in was wearing off. The only ship they could get to ship them to the scrap yard was a stolen warp shuttle. It was designed to carry two people and a fair cargo. Currently it was filled with five people in space suits, for sanitary reasons more than anything else, a ton of tinned food shipped over in the very shuttle at their combined purchase, along with hammocks and basic utensils. Mark had insisted they contribute a very large tip to the suppliers for the inconvenient in hastily produced wills along with a copy of the code Phil used to hack through security for their records. If they survived he wanted their court martial to have as much evidence pleading for mercy as they could. In the cramped space, however, they needed sedatives just to keep from killing one another. For most of the voyage autopilot was firmly engaged and they were drugged out to oblivion. Mark had not asked each of his 'crew' why they had agreed to join him on the suicide mission. Doubtless they had their motives, but there was no time to talk before committing mutiny. He would have liked to have talked during the voyage to find out just why they were risking their necks like this, but common sense and drugs prevailed. Asking questions might make them reconsider and, however much he had to pretend otherwise, he needed them. Better to ask when they were warping out and conscious. Time passed and Mark was able to run simulations through the computer to check his reaction time was up. He had to pilot the overloaded machine through several miles of debris yet. He reflected just how had ended up in Starfleet. He had always intended to be an actor. His emotional, artistic temperament was not geared towards command, not being cool in a crisis, but he had excellent eye to hand co-ordination and, with shuttle journeys and pilots ever more in demand, and with the arts refusing to pay as always, poverty had forced him to develop skills he always thought secondary. It was strange where fate led you. Now, here he was a starship pilot on a life or death mission to save the woman he loved. He was scared pantless but there was a strange sense that this was genuinely what his life had led up to. "We're nearly there." Mark let them now, dropping into manual as the shuttle dropped out of warp. The gently orbiting ring of junk was clearly visible. He rotated the shuttle so they had the spread of dead ships laid out flat before them. "That's great." Max said. "I could use a real toilet." "Tell me again, the washrooms are going to work on this crate." Jennifer asked Max. Mark shook his head. What a crew. It took forty five minutes of careful piloting to approach the heap and mix in with the rubbish. Patrol ships were rare, this was junk after all, but they did come and had to be watched for. The shuttle sensors were minimal so they needed eyeballing. It was disheartening to wade through the junk. Most ships had been stripped more than the end line Daedalus so Mark was conscious of the mass of derelicts missing engines, large sections of hull or even complete command modules. Other vessels were clearly pioneering technology, so primitive it cast doubt on the capabilities of the Galahad. Mark knew the truth of the matter but seeing dead hulks, black masses lit only by a distant sun and the proximity of the Mutara nebula made Mark's stomach sink. It took four hours locate the Galahad with many sharp words and shifts of navigation. The absence of sedatives was making everyone very tense. Then, finally, the ships before them span as Soogen, the only other pilot among them, rotated the shuttle to match the bearing of something seen. "There she is." He nodded. Mark squinted. Being used to seeing ships from one bearing he was surprised to see the ship apparently upside down, forgetting, as all gravity based humans did, that in space locations are relative. They moved in slowly and carefully, the ship coming into view. "It looks awfully small." Jennifer noted. "It's bigger than this tin." Phil pointed out. "That'll do me." "Hull looks ok, engines untouched." Max noted. "There's some ionisation and dents from rubbish hitting it, that's to be expected but she looks ok."
"You have no idea how much it means to hear you say that." Mark breathed. Soogen spun the ship around again to match the lay of the Galahad. Boarding the Galahad was done simply through air dock. For safety purposes docking had changed little in thirty years. Operation of the docking system was tricky, using umbilical cords and space walking to open the hatch, but they made it in. "Max. We're on the bridge. How's it going down there?" "Slowly. We're working by candlelight just about but Jennifer's found the battery supply. We're charging now. You should have minimal life support in about twenty minutes but you won't get gravity until the warp drive's up." "You've picked a fine ship." Phil radioed. Mark was unsettled. He couldn't quite tell if his science officer was being sarcastic or not. He knew he needed the faith of his crew, far more than any other Captain. "It's not bad for the money." He replied. "Can you start her up?" Mark could almost hear the shrug. "It depends on what's left in the core. These old machines use hard disks and bubble memory. There's a fair chance a lot of data can be retrieved via diagnostic tools. The main problem's going to be booting the operating system. These things use the DESMOND OS which is hard to find these days." "A computing joke. When Warp ships first became viable they had to produce a reliable, stable computer Operating system for use onboard starships. The white coats at the time came up with the Deep Space Network System, which was a name so dull they called it Desmond instead." "But can you get her started?" "With power, I think so." They waited. There was nothing else to do. As it was they had power after forty minutes. One of the batteries had rotted away, a fact that made Mark sweat for a while. But Max seemed confident the main components of engineering were sound. Then, suddenly, panels lit up giving off soft blue and green hues. It wasn't much light but they had a start. Mark fired up basic life support, oxygen filtering from emergency tanks that were too much bother to remove on decommissioning. It would take another half an hour before they could breath on the bridge, which was cutting it fine, but it looked like they would be all right. Twenty minutes later and the computer in front of Mark flashed up it's text display. They had basic computer functions. "It'll take a while before I get command functions." Phil reported. "I'm going to have physically solder past the security circuitry." "Just so long as we can fly." Mark informed him. One by one displays came on line. Half an hour and they could take their helmets off, although the heating only just made habitation possible. They shivered as they worked. Another hour, and the dim emergency lights came on. The fusion reactors were powered. A thrill ran through Mark. They had life. They were going to do it! After that things accelerated. Reports came through that impulse engines were intact and that emergency anti-gravity production was in process. Four hungry hours passed with command functions finally accessed and Mark was able to run a basic ship's manifest. He was pleased to note that Galahad was fitted with an early transporter, God knew how out of calibration it was. Subspace communications were conspicuous by their absence but, since they weren't planning on contacting the Federation anyway, that wasn't a problem. Unless they needed to send a distress signal, of course. All in all, the ship was old and relatively primitive, but she had the basic tools. Heating now made the bridge bearable, although no-one was in a hurry to explore the rest of the Galahad, permafrost taking time to melt and evaporate. Sensors were slowly activated and the view screen bleeped into life, showing the derelicts ahead. Finally Max brought the warp engines gently on line., "Just ticking over" providing a low gravity, sufficient to load up the food supplies from the shuttle. A cursory check of the galley revealed a functioning magnetic hot plate but, as expected, no pots or plates. "It'll be eating out of cans for the duration." Jennifer warned. Their first meal was cereal bars on the bridge, the rest of the ship still too cold and thin on air. Phil started. "The computers seem fine, but they are solid state so we should be all right. But no-one is to try and do anything clever until I show them how to use Desmond properly." "What about automation?" Phil asked. "Tricky. Until we have system functionality it's hard to automate. I'll have to work on it as we travel. Until then everyone is going to have to be careful. Autopilot should operate, however, so we can take shifts." Mark nodded then looked to Jennifer. "We've got basic life support, oxygen converters are working flat out, although for the moment I wouldn't explore the rest of the ship for another twelve hours. Cooking facilities are nothing more than adequate but we can do it. Sleeping's going to be the main problem. The beds will have been stripped out. We've brought a couple of hammocks and sheets and ripped the chairs off the shuttle, but it's going to be improvisation all the way." "Really. I'd never have guessed." Phil remarked dryly. Then it was Max. This was the critical moment. Without Max and Soogen giving the all clear they were sunk. Max's expression did not inspire confidence at first. "I can get you warp speed." He promised. "Yes!" Jennifer cheered. Max held up his hand. "It's not that simple." He warned. "The warp core has a minimal load. We can only make a short hop before we have to restart the fuelling process. It will take a week to grow enough anti-matter to leap to Cirrus. Also, nothing on this ship has been calibrated. It will take me some time to check over systems and a lot of the time settings will be best guess. I dare not take this ship above warp 1 until I've checked her over." "Where it will take about eight years to arrive at Cirrus." Phil noted. "We can get faster when we're more certain the warp fields will respond." Soogen added. "We just can't be certain it's safe right now." "Noted." Mark said. "You can only do your best. But if it takes a week to load up we've got to get there in three." "I assume you can actually pilot this hunk of junk." Mark resisted the urge to swallow nervously. "I'm pretty certain." He replied. "It's going to depend on the data in the computer as to whether we can pilot a constantly moving Universe, but the actual controls look much of a likeness to your average ship just a bit clunkier." So it was set. They could do it, just. The rest of the day (or night it hardly mattered in space) was spent in the Engine room helping Max and Soogen power up the vessel. Cold starts took hours to complete. Mark had to admit to himself, however, he was almost useless in engineering. If the bridge had been reassuringly contemporary, Engineering was archaic. Pipes, tubes and coverings were everywhere, ladders taking engineers down into cramped holes nudging up against good old fashioned wires. Mark had once seen the 20th Century file 'Metropolis' showing the early twentieth century's vision of the 21st, a world where light bulbs were still high tech. The Galahad's engine room reminded him of the film. "She's old." Max reassured him. "But it gives use room to improvise. It might look messy to you but to me everything's in plain view and everything can be patched up. It'd be worried if it didn't look like this." He grinned. "I wouldn't want to run a ship like this unless I was stealing it. But since I am, it's a first class choice." With that reassurance Mark was able to yawn. After eight hours on board Mark was getting tired, the adrenalin rush dying away. Now it looked like the Galahad would fly her 'Captain' was tiring. "Another hour." Max concluded. "We'll have a full warp field in another hour." It was then things went wrong. "Mark, Jennifer, report to the bridge." Phil ordered, cutting through on their spacesuit's comm. "We have company." It was hard to race to the bridge in low gravity. You couldn't run in the same fashion. Still, they did their best and Mark checked the viewscreen. All was quiet. "On Radar. We've got something moving." "The sensors are way out of alignment. This is all I can trust at the moment." Mark checked the signal. Bit by bit it was moving through the debris. "What are the odds they're seeking us out or it's just a ship on patrol?" "Either way we're in trouble. They detect power and it's phasers on kill." Mark swallowed. There was no doubt that he was sweating hard. He had instigated this wild plan, it was he who had dragged his friends in with him. He was, be default, their Captain, it was his responsibility to get them out of this. That did not make him feel the slightest bit more capable of handling this. He fought the panic that threatened to overwhelm him. Mark was not a natural born leader, he knew that. He was not calm in a crisis. But now he had to draw on underdeveloped reserves, shore up his confidence and fight on. He punched his suits comm. "Max, we've got company. I need warp speed now." "I need another hour." Came back the predictable reply. "We haven't got one. You've got to give warp drive now." There was a pause. "I can lock in the fusion reaction. It'll kill our reserves but that's all I can do. It'll give us a few minutes of warp." "That's all we need. How long?" "Four minutes, tops. You'll need to start the warp count down anyway." Of course. This was an old ship. You didn't just fire up the warp drive, you had to crank it up first. Max struggled to the navigation console. Jennifer took ops. "Jen, shut off light support." "We'll be all right for a good quarter of an hour. We have to shut off as much power as possible, give them less to find. I'll start the Warp countdown." Starting up their first warp run was not easy on the Galahad. On early warp craft it took time for the warp field to take.' When starting up from cold, it took even longer, a full three minutes to the Warp engines to warm up before the jump. "They'll pick up the warp signature without trying." Phil warned. "Not for a minute or two they won't. Are they in tractor beam range yet?" "They're still a fair distance." Mark punched up the co-ordinates on the helm, miskeying several times. He blinked and breathed slowly. Don't panic. Stay calm. He re-entered the navigation plan. "They'll be able to trace our warp signature." Phil warned. "It's certainly distinctive." "Yes, but they won't able to find us." "Where are we going?" Jennifer asked. They were interrupted. "They've found us." Phil warned. "They're on their way." "Is it a starship?" Jennifer asked. "It's not a freighter?" Phil shook his head. "All I can give you at the moment is size and distance but, yes, I think it's a light cruiser." "Damn!" Mark breathed. He checked the warp coil register. Only half powered. He hit the intercom, hoping it still operated. "Hold on everyone." He warned. "I'm engaging Impulse." He gave them five seconds then fired the impulse drive. The bridge wobbled and ground but they were not thrown back. Inertia compensators where hardly on pinpoint accurate configuration but it was proof they'd survive warp jump. Probably. Keeping impulse speeds low mark weaved the ship through the junk, trying to keep the larger starships between the Galahad and her pursuers whilst heading out to a safe warp environment. It wasn't easy. The Galahad was not built for close range manuovering and it was all Mark could do to avoid hitting San Fransisco class starships. As it was there were numerous clangs as the Galahad crashed into the rubbish surrounding them. "I think they're trying to head us off." Phil warned. "As much as I can see anything. "Put life support back on." Mark ordered. The needle was just touching the red mark. He pushed the ship's impulse engines up. They shot forward, escaping the debris when lights flashed on the helm. The computer, needing a clear path to Warp, had taken over. The stars span as the ship automatically manoeuvred herself to face the right direction. Mark punched the intercom. The warp engines fired. Mark was shoved back into his seat as the ship leapt into flight, sudden G forces threatening to crush his bones in on themselves. The roar of long disused engines were matched the creaks and groans of a hull unused to such thrashing. Jennifer's console exploded sparking in small flames and sparks. Then, slowly, the pressure eased as the acceleration slowed. "We have got to get the Inertia compensators aligned." Jennifer gasped. "Are they on our trail?" Mark asked. "Can't tell, I think we surprised them." "But we can't assume anything." He hit the intercom. "Max. Max?" "Aye?" Came back the bruised sounding Max. "Max, I've got to have warp 2. Tell me we can do it." "I don't know. I'd advise against it because I don't know how she'll take it. If you want to risk it, well, you're the Captain." "We're being hailed." Jennifer reported. "Well, while they're talking they ain't firing. Put them on." The message was distorted and disjointed, radio transceivers hardly tuned, especially at warp, but they got the message all right. "Crew of the …had, this …… of the ...ship Pegusus, drop out of warp and….rneder. You're no Con.ition to maintain Warp…"
Did they detect something in the warp field they couldn't or was it a bluff? It wasn't really a question worth answering Mark decided. If they dropped out of warp they lost the battle anyway. They'd never get another chance. If there is a God, he thought, see us through this. We do this for love of others. "Hold on." He warned. He pushed the ship forward into Warp 2, close to half the speed the Galahad could handle. Again the G forces hit as the ship bucked and rattled wildly, inertia compensators struggling to divert forces that little but too slowly. The whine of the engines drowned out speech for a good minute as the aged ship thrust forward faster and faster. Particles illuminated by the light now stretched to four times normal length to view flashed past the screen as a dull red cloud approached. The G forces dropped back as the cloud grew nearer. "The Mutara nebula." Phil noted. "Clever." "They won't be able to find us there." Mark confirmed. "And there's ample amounts of hydrogen, helium and basic elements to draw from." Mark couldn't look behind him, not now, but he could just see Phil nodding approvingly. "How close are they?" "No idea. Radar hasn't a chance of working at this range. I'll try and see what I can get out of sensors but I'm promising nothing." There were clicks and bleeps as Phil operated long disused cameras and sensors, many of which were almost certainly no locked solid from disuse and particle invasion. Jennifer turned to Mark, not yet daring to move from her seat. "There's no way we're going to outrun them." She said. "Agreed, but I'm hoping we've surprised them and I'm guessing they don't want to fire on us. It's going to look bad the Federation killing five renegade officers on an unarmed pile of junk. What we've got to do…" There was a bang and a lurch. Mark hit the intercom. "Max, what the hell was that?" The answer came from Phil. "A Phaser shot, port bow. I think it's a warning shot." "My God, they really do want us to stop." He glanced up at the nebula, now filling the screen but Mark knew it was long way off. "We're not going to make it." Jennifer breathed. "Jennifer, hail them. Tell them we're going to surrender but we need to decelerate slowly. They'll know our inertia compensators are frazzled." "Just do it!" Mark checked the instruments. There was very little in reserve but… "What's their answer?" "Agreed but we're to turn away from the nebula while they come alongside." "Confirm, then hold on very tight." "Mark, wake up." Mark blinked felling very very tired. He wanted to sleep. "Mark." Jennifer was standing over him, looking concerned. "Is he all right?" A voice asked. It sounded like Phil. "I think so. Mark?" Memory flooded back. "I'm fine. I… I blacked out? How are we?" Jennifer breathed a visible sigh of relief. "Alive thanks. You did it, we're in the nebula." Mark glanced at the viewscreen. It was blank. "It's all right, Max has taken everything off line to conserve power. Your leap took everything the Galahad had left. We're refuelling now from the nebula. Max has put a strict ban on your touching anything that uses power now. He seems to think you're a black hole for some reason." Mark nodded gently, then wished he hadn't. The headache that emerged was almost overpowering. "The ship?" Phil moved into sight. "Survived. I think you're insane but we survived." God, I still don't think you exist. But thank you. Technically I'm not a Captain and by now I'm probably on the Federations' most wanted list and stripped of rank. So I may as well go right ahead and add impersonation of an officer to my crimes. This log will serve as a record of the crew of the USS Galahad and evidence that our objectives remain peaceful and our intent only to preserve life. For the record, we seem to have shaken off the starship that fired on us, probably because sensors are useless in the nebula. This, of course, does not affect the Galahad since sensors are useless anyway. I am concerned at the show of violence shown by the other ship, the name of which remains a mystery. Why fire on us, even in warning? I am amazed at the level of interest taken in our disappearance. It appears Starfleet want their little gateway to Romulus very badly. We assume they traced the shuttle's trajectory to find us, or their personality profiles of us are really good for them to find us so quickly. The Galahad remains shaken but not stirred. Life support is now at full capacity throughout the ship, although one of the crew quarters has been sealed off due to a hull breach. Work is continuing repairing and calibrating the Galahad. She is unlikely ever to be overhauled but we believe engines can be brought to full capacity and most sensors fixed through space walks. Repairs have been carried out faster than expected. Most of the Galahad's problems are due to mis-calibration and jammed systems which could easily be reset. Obviously due to the nature of the nebula it is impossible to check sensors. Because of the abundance of helium and hydrogen anti-matter conversion has been a faster process then we expected. The Galahad should be able to cruise at warp 3.4 meaning our arrival at Cirrus in around three and a half weeks. Now it becomes a question as to whether the survey team are still alive to be found by then. Max has hopes that he can squeeze more out of the engines on route. They departed after three days, fully fuelled with sensors as aligned as possible via space walks. Testing was impossible within the nebula but there was no time for more. They had to make their arrival within two weeks, Any longer and the survey team would suffer irreparable damaged from starvation. Any further repairs had to be done on route. Thus, with the aid of Phil who provided a working computer system, (steam driven from Mark's point of view) and up to date star maps via his laptop, they had all brought up to date information on their portables, Mark set the warp count-down and they leapt towards the Jefferson encounter. After that Jennifer insisted the crew, within shift rotation requirement, got a good rest. Mark did not complain and promptly went down with flu symptoms for the next two days, rending him incapable. Stress could really take it out of him sometimes. He was not command material. Once the ship was on it's way, however, there was little more to worry about. Given the long journey times of interstellar space, particularly on older starships, much was automated. Phil worked tirelessly reprogramming the computers giving the bridge further controls over command functions ensuring less work for all. There was little conversation with Phil but he seemed to prefer it that way. The only real problem was speed. It was dangerous running the ship at it's maximum speed for Warp 4.1, but they had to reduce a cruising speed journey of months to weeks. Max and Soogen together were able to bring the engines slowly to full potential and varied the speed of the ship between 3.6 and 4.0 to reduce journey time. It made their ETA indistinct but it looked like they would be on time. Remaining issues were internal ship repairs - a lot of systems, though far from the majority, failed on activation after the long sleep - recreational, they were sleeping in hammocks, eating out of tins with few chairs and no tables and no recreational activities. The laptops helped along with opening the few bottles rationed out by Jennifer. That, in turn left one major problem. They conveened the meeting on the bridge. The conference room had been stripped bare. "The only item on the agenda," Mark began, "is what do we do when we get there?" "I thought we slipped through space and got them back." Jennifer said. "There is the small matter of a heavy armed starship at this end." Mark reminded her. "After all," Max said, "If there wasn't one before there will be one now after the stunt we pulled at Mutara." "So the question is, how do we get past it?" Mark asked. "We're unarmed and don't want to fire to anyone anyway. They will probably have been given orders to order our unconditional surrender followed by immediate photon torpedo volley." "What's a photon torpedo?" Jennifer asked. "I'm medical, not munitions, but I didn't think the Jefferson had them." "We didn't." Soogen assured her. "They're new and complicated. Suffice to say that they generate a nice anti-matter explosion which penetrate shields far better than nuclear explosions. They'd rip through this ship in no time." "I had to ask." Jennifer swallowed. "Can we raise shield strength?" Mark asked. Max answered. "Mark, this is a Daedalus class starship. You've got shields on or off, re-modulation or power enhancement are right out even for me." "We can disable the ship." Phil interjected. All eyes were on him. "Security systems are easily by-passed if you have insider knowledge. I got us a shuttle through hacking, I can disable the ship." "You'd need to know the exact system configuration of the vessel you're going to meet!" Max countered. "It's not that easy." Phil frosted him with a stare. "I do wish people would think before opening their mouths. All you need to know is the probability of the class of vessel we'll meet. Based on risk assessment I have narrowed down the vessels likely to meet us to three and the odds of Lancaster class intercepting us are better than seventy five percent. I've already written code to transmit a virus that will disable their weaponry." "How will you send it?" Max asked. "The Galahad doesn't really handle subspace." "We'll have to use radio." Phil retorted. "But that takes time, and needs a receptor. They're not going to listen in just to have us send them a virus capable of circumnavigating security." "Agreed." Phil responded. "It'll have to be a clever virus but I can send a smaller carrier via radio when we reply to their hail for surrender that will force their comms open." "But radio's just sound isn't it?" Jennfier asked. "Which carries digital signals which must be decoded for potential video data. I can get the processor's attention." Phil assured them. "I just have to be clever. Leave me alone to do the job and I'll shut that ship down." "You won't damage it?" Mark asked. He noted what looked like a sigh from his science officer. "I'll keep it benign. The virus will shut the ship's defences down for a few minutes then destroy itself. We can surrender on our return. The only problem is time. Even a small virus of this complexity is going to require several hundred kilobytes If I could transmit via subspace we'd be all right but we've only got radio and a slow baud rate. I need at least twenty seconds after the initial signal to transmit the code." "They could massacre us in twenty seconds." Max warned. Mark knew it. Even their impulse engines were behind current technology. Compared to even a small cruiser like the Jefferson the Galahad was a small, under powered snail even at sub light speeds. They could take may be one photon torpedo and then, given the weakness of their shields and the fact that half the ship was given over to the warp drive system they'd blow like the innards escaping a squashed grape. "Can we think about it?" Max asked. "Sure. But hurry. We've only got a few days and the faster we get there the less starved the survey team are going to be." So the meeting adjurned with little actually concluded. Again Mark was reminded just little of a leader he was. If he had been Captain Lim he'd have managed to draw out a sophisticated, intelligent solution to their problem there and then. Somehow a real leader gave you the impression something was expected from you. Mark was, as many women had told him, just too nice sometimes. To cheer himself up he joined Soogen in the transporter room. The discovery of the transporter room was very much a bonus. Very few Daedalus class cruisers were equipped with such devices. Mucking around with atomic blueprints and quantum fields took a lot of power and a lot of computing technology along with a greater understanding of physics than was available in the early 22nd Century. But Mark had guessed the Galahad might just have an experimental model fitted. He knew such devices had been fitted on late 22nd century starships and were rarely removed being so tightly integrated to the central Matter/Anti-Matter power system. He had been proven right, again justifying his choice of starship. It had to be said that they had been lucky in many respects with the Galahad. If the transporter could be made operational they could beam weakened crew members on board in minutes rather than the hours needed to send a shuttle down, bring them on board, re-docking and the rest. However, first glance of the transporter did not inspire confidence. It was clearly a first generation mode with only two pads and great perspex doors that slid across the platform 'in case things went wrong.' Large computer banks lined the walls ready to store data patterns, the blueprints of his body and soul. "Will it fly?" He asked his Indian engineer. "Maybe." Soogen said, smiling uncertainly. "It's not in the best of shapes. The system has to be perfectly calibrated. These first generation machines are hard to keep aligned. At the moment there are fluid leaks that would fry you with radiation if I fired her up right now and I know there are faulty boards in the computer banks. "So if I was to use it I'd get fried?" Soogen shook his head. "The system's primitive but it's fail safe. Experimental it was but Starfleet wouldn't have fitted it if it was unsafe. She'll just cut out. These old system overheated if used constantly and needed to shut off for half and hour or so while things cooled down. One of the recent break throughs has been coolants that can cope with superheated matter without changing it's nature. If you like, it's unreliable but safe." "Give me a screwdriver then and show me what I can do then." Soogen did just that. "Open up the RAM banks and look for dirt on the contacts on the boards. That's the first thing to check here." Mark did just that unscrewing the bolts on the first box. "Soogen?" "Why did you come on this mission? I mean, you know what we're facing. They may already be dead by the time we arrive. It's not that I'm trying so suggest you shouldn't have come, but why you? Why did you choose court martial?" Soogen pulled a circuit board out of the transporter console. "That's easy. Because life is precious." He glanced up at Mark. "As love is important. I believe in the Federation as I believe in God. But if we forget what the Federation stands for we lose the Federation we have built." "So it's a matter of principle with you?" "It isn't for you?" Soogen ran the device through a diagnostic tool Mark wasn't familiar with. "Why do you ask?" The question was pointed. Soogen knew the question Mark was really asking. "Honestly? Because I worry we've made a mistake. I've dragged you lot into a mess that I can't get you out of. Maybe the Federation's right. I'm putting the future of the Galaxy of the line for my obsession. Some would call me mad." Soogen nodded. One of the things Mark liked about Soogen was his inner calm, a calm Mark knew he simply did not have. He was the closest thing to a chaplain they had on the Jefferson. "Maybe. But that makes the rest of us mad for coming with you. Let's say you have made a mistake you intended no harm, right?" "None. We carry no weapons. I want to save life not lose it." "Then this mad mission is for the most honourable of motives. Of course Starfleet cannot mount a rescue operation but you've done what they cannot do. A renegade officer steals an outdated starship to hunt for his lost comrades. If the Romulans do find us, the Federation can say with complete honesty they tried to stop us. I think they will try and try hard, but many will be wishing us well. If the citizens of the Universe are going to go to war because a mad mission of love then the Galaxy does not deserve peace." Mark blew on a circuit board. "I don't follow you." "I'm saying that we all get it wrong. What matters is that you try to get it right. You have been given an impossible choice. You've done the best you can to reconcile the options. It required a mad solution and you've provided one. Now maybe it is the wrong choice. But you're motives are right. All our lives are spent making wrong choices. This one is at least honourable. Now we just try our best to make that mistake work content to know that we made it for the best of motives." "But what if my motives weren't honourable?" Mark coloured. The great unspoken had been spoken but Soogen was intelligent enough to tackle the begged question head on. Soogen carried on. "You know she's engaged to be married?" Mark nodded. "You would not stop the wedding?" "You would let her find her own happiness by her own choices?" "You would let her go?" "I already have done." That was the truth. It hurt, but, while he dreamed, he never hoped. "Then you are risking your life for true love, love that gives without need to be repaid. No, you not win her over even by this, but if you remember that and carry on, you will acting with honour." That sort of made Mark feel better. He made a mental note to discover why the rest of the crew came on board with him. As it was he was signalled by Max. "It's simple." Max said in the cramped confines of the engine room. "We can't scan for the fold. If Phil's physics are right it will be invisible to anything this ship can check for. We're just looking for space within space. So the only way we can find the 'hole' is by shooting rocks at it." He lifted up a tiny box. "Rock!" He cried. "A dumb probe that beeps. We fire out a dozen of these via the probe launchers and see which ones disappear." "Brilliant." Mark replied. "Sheer genius, but how does that help us tackle a heavily armed shielded starship?" "We get a bigger rock with a very basic propellant and direct it via remote control from here. It heads towards the ship. They concentrate on the bomb like object heading their way trying to hit them while we hack into their computers. It's distraction, nothing more." "Will it buy us twenty seconds?" Max shrugged. "Might do. Won't hurt. I've only got time for one so I'll try and make it last." It was the best they had. "It'll do. Great move, do it. Oh, and Max, just out of curiosity, why did you come on this mission?" Max was already looking at fuel pipes. "Well it's a laugh innit?" Mark left it at that. Some people don't like exposing their inner soul. The Galahad continues at a fair pace. I am concerned that we simply cannot arrive any earlier than three weeks after the Jefferson was recalled. If the team have survived this time they will be starving. Jennifer has emergency rations on board although I gather they will have to be fed liquids to start with. She has brought dried milk and will be beaming down with me. Phil and Max are working together on stalling the expected Starship. My priority is working with Soogen on the Transporter. Internal tests with the transporter were disappointing but Soogen has made remarkable progress linking his laptop into the transporter system to replace damaged systems. He believes we will be operational on arrival. I hope so. Max has built the small probes and is working on the 'bomb.' I hasten to add that, should the bomb be destroyed before it's nature is known, it is just a dumb decoy. We wish, as always, no harm to anyone. We hope to arrive at the Jefferson's last deep space location in a few hours. Max has the probes locked for launching. Soogen continues to work on the transporter which seems so nearly to work. The shuttle is on stand by in case, even if it is stripped bare.. This is where we gamble our lives and our liberty. To that end I have ordered Soogen to pray his rosary at hourly intervals. Mark closed the hatch behind him locking it down. The ship was on battle status. The lights on the bridge were dimmed for red alert, improving concentration. His clothes, crumpled from improvised laundry, were clinging to him with the sweat. He passed by the command chair to the helm, running almost right up to the view screen in the pint sized command deck. Jennifer was already at her station, Phil at his with laptop on his console connected by cables to systems themselves hacked around. The whole ship was running on sticky tape Mark reflected. Not a reassuring thought when you were heading into combat. He checked the warp clock. "Three minutes forty seconds." He noted. "Probe launchers primed." Jennifer reported. They were in Starfleet mode, looking cool, professional, focused. It was a psychological game more than anything else Mark knew; keep cool and you stopped panic spreading, never mind how you felt inside. "Computer status?" Mark asked gripping the console so his hands would not shake. "Comms already open. I will transmit the moment we have contact." What if they fired first? They'd never know about it. How comforting. Dear God, please, don't let them be there. Please let Phil be wrong on this, please. He watched the screen, warp particles flashing past. Time passed. Seconds both crawled by like snails and flashed by like lightening. Everyone gripped their consoles. They thought they'd got the inertia compensators sorted but they had leapt to Warp and never dropped out since the Nebula. The lights on screen stilled and the stars appeared. No jolts. Good. "Set scanners. Any signs of company.?" "Negative at first glance." Phil reported. "Scanning as we speak." Mark checked their current location, mapping star positions and proximity readouts approximating their position. Leaping to a solar system was one thing, but a solar system was a lot of space to get lost in. He had to thrust the ship to the exact co-ordinates. That in itself could be days away depending on how accurate Mark had got his warp calculations. "Engaging full impulse." He reported firing the sublight engines, rotating the ship to match new co-ordinates. "How close are we?" Jen asked. "A couple of hours I think." Mark replied. The were the longest hours Mark had ever known. The Galahad flew forward but, given the vastness of space nothing moved on screen. There wasn't even a dot on the screen growing larger as in the case of a planetary orbit since what they sought was invisible. It came after two hours, six minutes. Mark slowed the ship to match a location matching the relative proximity of the Jefferson three weeks earlier. They fired the probes in a spread through the remaining working probe launcher. Then Phil gave them the news. "I have it. Ship approaching half impulse." "Shields up." Mark ordered knowing, even as he gave the order it was almost pointless. They were not here to fight, dammit! And damn you God. "Class?" "Closing... It's a Lancaster bearing 238, 45 mark 7." Well, Phil's guesses had been right. Here was hoping his coding was just as accurate. Mark manouvered the Galahad to face it's aggressors. Sure enough, also rotating to match them was the bulking shape of the gunship, so called by the fact you could see the torpedo launchers even from a distance. "Put them through." Mark ordered. The radio signal was less distorted this time. They needed a good carrier and radio was easily repaired. "This is Captain Faraday of the USS Eisenhower. You are under arrest for mutiny. You are ordered by Starfleet Command to drop your shields and prepare for boarding. You have twenty seconds to comply or we will open fire. This is your only warning." Mark knew they were serious. They had escaped by lying last time. They had embarrassed at least one Starship Captain. This one would be sure to distrust anything except unconditional surrender. Mark was on the internal comm system. "Max, stand by probe bomb." "They're counting down." Jan warned. Mark was on his feet. "Give me the mike." He ordered, heading over to comms. He raised his hand as the signal to Phil. He hit the 'Transmit' button and dropped his arm. It was virus time. "This is Mark Smith currently commanding the USS Galahad. We come in peace, we wish no fight with you, we only..."
"We're not interested in what you want." Came the harsh reply. "Surrender or we fire in four seconds, three, two..."
Mark hit the 'local' com channel. "Launch!" He screamed. He looked up at the screen at the crimson bolt flew towards them. He leapt for the helm as the whole ship suddenly keeled over. Circuits blew as Mark grabbed the back of his seat for dear life. They were not joking! "Shields down!" Phil yelled. Mark took his place and fired the impulse engines. There was no way they could out run or out manoeuvre the Eisenhower. He could only plough towards where they thought the fold was and hope. "Where's the gate?" Mark screamed. They had seconds. "All probes are registering. I don't know." Came the reply Mark was not looking for. "Has that virus gone yet?" Mark looked up at the console. They had no way of seeing what was happening, not in the time they had. Was the distraction probe blown away the instant it left the Galahad, or had it weaved it's way past hostile fire to bump harmlessly against the Eisenhower's hull? Had the virus arrived uncorrupted, undetected? They waited. "Probe four lost! And three!" Phil reported. "Bearing 43, 23 mark 2." Mark's fingers flew over the clumsy controls, the Galahad wading over. The Galahad had served them well thus far but she was not built for combat. "Stationary." Phil replied. "I think we've got her." Mark dared not hope, not yet. "Jen, hail them, tell them..."
Mark froze. He felt no sensation but the whole of space around changed. On the viewscreen stars became blurred lines, patches of colour rippling past them as if, well, it could be true, they passed by light years of space with all the associated stars merged together, like passing through the water in a glass, bending light around them. "We're transversing the fold. I'm getting sensor data." "Good." Mark swallowed. "That's good." Just as suddenly the stars came back. Mark took the engines off line. "Status?" He barked, as far as he could after all that. It took several minutes to get a full status report. The Galahad's computers were primitive, the sensors limited and the whole ship put through far more than a vessel of it's age and design had been designed for. Actual damage was minimal. The shielding had collapsed after only one shot, that was true, but had captured the strike from the Eisenhower. The exact status on the attacking vessel itself was uncertain. The fact that the ship suddenly seemed to stop moving and that they were alive indicated that Phil's virus coding was as clever as he claimed, though Mark recalled he had ordered his 'officer' to disable weapons only. Still, there was every chance the Eisenhower never got up to speed in the few seconds of combat before the Galahad would have been seen to have disappeared. Phil was able, however, to confirm their arrival at the Romulus solar system. They were now in violation of treaty and a potential instigator of war. From down trodden artist to space pilot to renegade Captain to the biggest threat in the Galaxy. Was this promotion or not and would it impress the girls? Would he ever see one again after his trial? Scanning located a planet matching the mass and colour of the lone world some couple of hundred thousand miles away. There were no signs of Romulans. It was quite possible, knowing the Romulans primitive technology, that ships were so slow and so few and far between in the vastness of space that they would not detect the Galahad. But they were right beside Romulus, even if the planet were out of plain sight, a dot on the 'horizon.' You never knew. An hour later and they had orbit, scanners firmly locked on the dull grey world. "Do we have a signal?" Mark asked. They had a whole planet to search. The Galahad, with it's slow processing computers and low range sensors would be hard pushed to map the planet in days, and they needed to cut back their stay by the minute. Jennifer shook her head. "Nothing. But their suit batteries will have exhausted themselves by now. I doubt they'll even have a radio operating." That caused a major problem. Using the Galahad's limited sensor and computing power, mapping the planet would take days, far too long. It was a problem they had discussed, however. "We're at a high orbit." Mark told Phil. "Run a sweep. Let's hope they show up on a quick scan." They took the Galahad on a quick orbit of the planet running snapshots of the planet, blurring the images but hoping that the ship would appear so distinctly that they would recognise it. As it was, they didn't need to. "Mark, I've got a signal." Jen confirmed. "Where? How?" Mark barked, on the edge. "It's a radio pulse. There's no more than a beep but they're there." Jennifer shrugged. "Not without closing in. They must have some sort of solar power running. Clever." It took a further quarter of an hour for Mark to manoeuvre the Galahad in to match the weak signal. Finally they had an image, a grey cluster of cylinders. Nothing more. "Life?" Mark gulped. This was his moment - Redemption or devastation. She was alive or he would die inside with her. "Infra red on. That's all I've got." Phil reported. Mark didn't move, didn't respond. Infra red was enough and everything in him was braced for the best or the worst. Seconds passed. "I've got it." Phil reported. "I have heat signals. There's life." "It's not just heating without life?" Mark asked. Phil shook his head. "I can't get exact body matches here but I've got separate heat sources. I've got their co-ordinates. We've got them." Mark was out of his chair. "Yes! Relay co-ordinates to the transporter room. Jennifer, come with me." To Mark's surprise, Phil rose to meet him. "I need to go down." He said, a statement of fact apparently. Mark blinked. "Phil, you don't need to go down. There's nothing needing a science officer down there. Jen and I will go." Phil shook his head. "It's you who don't need to transport. You have no medical training. Jen and I both have. We are the logical choices. You should stay here." Mark peered at Phil closely. This was all news to him. "I didn't know you did medicine." He said. "Basic medical only. Required for field missions. It's not a lot but it's more than you've got." Logically Mark had to agree but he was no longer operating on raw logic. "Fine, whatever. We'll all go down." "Mark," Jen cut in. "Phil's right. I didn't know about his training either but you don't need to go..."
Mark just pulled open the hatch. "Yes I do." Was his final and only reply. By the time they arrived at the transporter, computer programs written by Phil holding the bridge together in orbit, the transporter pad was humming in a reasonably healthy fashion. "You got it?" Mark asked his technician. "I got it." Soogen replied. "You're absolutely certain? It's my life in there." Soogen nodded. "She's running. But we can only handle four transports before the coils overheat. Then she'll shut down for about half an hour." With only two transporter pads that was far from enough. "We'll have to stay." He noted. "Only for around half an hour, as I say." Soogen confirmed. He bent down under the transporter console and pulled out two strips of cloth with various components sewn on." "What are those?" Mark blinked. "Belts?" Jen echoed, just as bemused as everyone else. "This is first generation device." Soogen reminded them. "Ship's like the Galahad don't have scanners and transporters clever enough to pick up individual traces without a signal lock. A transporter belt gives a signal to the transporter so it knows what to lock onto. Communicators are too vague for this bit of kit. Obviously there would transporter belts supplied but I had to improvise. "Better and better." Jen mumbled. "You're sure these will work?" "I tested them on myself only fifty minutes ago." Soogen confirmed. Mark shrugged, taking the rather fragile looking items. "I take it we don't need them to beam down." Soogen shook his head. "Use them on the team down there. We'll beam them back, the belts that is." Mark moved up onto the transporter pads, Jen following. Phil was sensible enough to wait his turn. Mark was reminded just how little he knew of the taciturn science officer, or why he came with them. A question to ask while they were waiting presumerably. He turned and faced the transporter engineer, Jennifer joining him. Immediately there was a squeaking and grinding as large perspex shields slid across covering the transporter bay, again instilling confidence. Mark swallowed. His hands were sweaty. There came a louder humming, then a buzzing, then everything grew red, then... The red light passed and Mark found himself in the dark. The air was stale bringing almost immediate drowsiness. It was chilly. Somehow, throughout the journey Mark had forgotten about the issue of heating on the ship. He looked around. There, lying on the ground were five bodies, still in their suits, helmets lying around. The room was small, lighting almost non existent. Cabling strewn across the floor indicated emergency adaptation. They had managed to instigate just enough life support facilities to sustain a bit of life but this was clearly more than a case of malnutrition they were dealing with. Mark knelt beside the nearest body. It was an Ensign he did not recognise. He slapped his face. It was horribly gaunt. "Ensign. Ensign?" He hissed. There was a little stirring. The youth opened his eyes dreamily. He frowned, clearly not sure what he was seeing in the darkness. He tried to say something but the sound of beaming drowned out the whispered words. The extra light allowed Mark to catch sight of the team. They were stirring at last. The air was certainly poor quality. Their oxygen recyling system was capable of keeping hearts pumping and brains working but not much more. They would have spent a lot of time asleep, along with malnutrition. "You came." One of them croaked through dry lips. Mark's eyes were on Anne. Within the confines of the suit it was hard to see exactly how she was faring but her face was fleshless, her skin pale. He looked dead and she looked at them with dead eyes. "Jen?" Mark asked urgently. She was up against the first of the survivors with a hand scanner, one she had purchased herself as a student. "Severe malnutrition." She diagnosed. "Muscle atropy, blood toxification..."
"Brain damage?" Mark asked, his eyes still on the uncomprehending Anne. "I don't think so, just weakness." Jen replied. "But we've get to get them up now." She opened up a case and brought out cartons of milk, punching straws in. Mark immediately moved to his beloved Anne then stopped, afraid to touch. Suddenly he realised he shouldn't have beamed down. He was not a medical man. He felt a tug on the teleport belts. Jan took his off him, kneeling beside the weakened Anne. "I'm here." Jan reassured, slipping the cloth belt around the girl. "We've come to rescue you." "About time." The girl mumbled. Relief flooded through Mark. There was no cognitive damage. He was also aware that Anne had not recognised him, so little impact had he made on the girl's life. Mark turned to Phil who was already activating the communicator pack. Jen rose and too the second transporter belt, slipping it on, then handing Mark the milk. "Send up the next two weakest." She said. "Then feed the remaining on this, just a little. Don't force anything more than few mouthfuls, oh, and they're liable to be sick. They've got to learn to eat again. Get Phil to help you." Mark nodded dumbly. His heart was part way flying to the brightest star in the Galaxy and part way falling into a massive black hole. "Phil to Galahad." He heard Phil calling through. "Two to beam up." The humming filled the rom again, then the buzzing and the red glow of transport. For the first time Mark saw the slow fade of the Galahad's transporters. Slow, but far faster than shuttle. It was followed by the glow heralding the arrival of the transporter belts. Mark prepared the ensign and an unknown officer for transport when he noted Phil picking up and securing the tricorders. At first Mark flashed with anger. This was not the time to collect souvenirs. But then again, their mission was all but complete. He owed Phil too much to tear him down now. He ignored the dereliction of duty. He got Phil to initiate beam up then, when the next couple had gone, confirmed their arrival and treatment. "Jan's got them lying in the transporter bay feeding them. There's nowhere else for them to go that's any more comfortable at the moment." Soogen informed them. Mark crouched beside the communicator. "How does she think they'll do?" He asked. "I think it's too early to tell." Was the honest answer. "The transporter's down. I'll beam down the belts when it's time." After that there was nothing else to do but feed the survivors. This was far from easy. In the stale air and poor lighting it was hard to distinguish much. Both the remaining survivors were weak but tried to speak. Mark ordered them to be quiet and try and drink. As Jan predicted they were quickly sick but second and third attempts at feeding produced better results, giving their bodies a little more energy to survive on. Now, if they could get them better air and warmer conditions, they would be able to heal and recover Mark was sure, well, nearly. Then it was just a waiting game. Mark looked up to see the glow of a tricorder. "Some intriguing data." Phil replied, bit nothing more was offered. Mark didn't push the issue. Once they beamed back as far as Mark was concerned their mission was over. They would return to Federation space and surrender. Mark had no fear in his heart for that moment at all. He would exult as he was arrested and Anne taken into proper care. So anything Phil did now was up to him. Mark didn't really care any more. Still, they had a little time. "Phil. Question." He took the silence as a 'Yes?' "Why did you come on this mission? I didn't have time to ask when we left and you virtually lived inside the ocmputer for the journey here. Just why did you risk everything to come here?" "It was necessary." Was the reply. "Yes, but why? The Federation didn't think it was necessary." "The Federation are idiots." Came back the cutting reply with more venom than Mark expected. He was surprised. "They don't recognise people's true value." "Well, I agree they haven't in this case, but we're normally pretty good..."
There was a snap as Phil closed the tricorder abruptly. "Do you know that I introduced the principle theories of practical travel by Quantum Singularity?" "No. I thought Warp technology rendered that pointless." "Exactly, people are so short sighted. Yet the Romulans proved that the principle worked. I calculated the mechanics, an alien race proved it could work, and what recognition did I get? Twelve years I've remained a secondary science officer! Twelve years stuck on elementary exploratory missions." Mark said nothing. He knew the reason Phil had never been promoted any further. "Personality unsuited to command." Mark knew the assessment of command capability had the same statement on it. One of them was just too cold, too clinical and, frankly, narcissistic. The other, just too emotional and self depreciating. However, Mark knew in his heart he didn't want to command. He wanted Anne. Of course, neither Phil or Mark were going to get what they wanted. But it suddenly sounded like one of them was angrier about it, more angry than Mark expected. He didn't want to remind Phil that Romulan experimentation with Singularity drives had proven awfully unsuccessful during the Romulan war. Now was not the time. "No, the Federation ignores it's true potential." Phil continued. "It ignores a faster mode of transportation on expense grounds, it ignores the truly intelligent. It's sowing the seeds of it's own downfall refusing to invest in those of us who actually know how to get things done." Mark stayed silent. Phil was clearly not talking to him. Instead the angry child was making itself heard. Mark had always been aware, as was everyone, that Phil harboured anger. He was always cutting towards to those who did not measure up to his exacting standards. Like so many perfectionists he could not see that perfectionism was, itself, a flaw. But this outrage, this flaming resentment was news to Mark. Now he began to see why Phil had come. "You came to spite the Federation?" He asked. "I came to help you save your friends. I've done that. Now I just want to examine this very interesting data on tricorder." Mark left him to it as Phil felt around in the darkness for another of the survey teams devices. The frost had replaced the anger, obviously freezing it in place but not removing it. Still, Phil's anger was his problem. Mark had his own. His seeing Anne again was affecting him emotionally again. In the darkness, with nothing to do, he could only wrestle with the extremes within. The longing to see her had been replaced by an even greater longing to be with her. Seeing Anne emaciated, barely conscious had been a shock to him and now he was fearful that she would yet be lost to him by dying even as he rescuing her. The only thing they could do was return to Federation space and surrender to the Eisenhower thereby putting Anne into proper medical care. But then he would be separated from her. Now he had time on his hands, worry was kicking in. Would he get just a dishonourable discharge or would there be a prison sentence? Would he ever be able to see Anne again? Would he want to? She would be returned to her true love. Throughout the journey Mark had known a sense of near invincibility in regard to Anne. For once he was doing something brave, manly, he could commit his energy on a desperate bid for love. He believed he would be able to face his court martial with pride having saved life, having saved the one he loved. But now he faced the separation he felt no pride only the hurting ache of having something precious inside ripped out of him again. Well, he had done the deed. There was no going back and no other decision he could have made. This way he could live with himself. But he feared he would never be happy again. It would take the Galahad forty minutes to return. He had only to set the course and get them back. He would see Anne but once more and then say goodbye forever. He wished he believed in a God to whom all this would matter. The minutes passed. Mark managed to feed the survivors a little bit more as their stomachs appeared to adapt to receive liquid. Phil did no more except trace data in computer banks. Part of Mark was angry. Phil insisted on coming down on medical reasons but now just seemed interested in augmenting his knowledge. But then, how much more was there to do. In the end Mark ignored the science officer. He had played his part. If he wanted to play with tricorders now, well, that was up to him. Finally the call came through. The transporters were back on line. The belts appeared slowly in a red haze. In a short while Mark had the survivors beamed back. Then Phil and Mark prepared for transport as the belts here prepared, Phil taking two of the team's tricorders with him. "Energise." Mark ordered, picking up the comm box. As the transporter haze passed Mark found himself surrounded by the sick laid out on the transporter room's floor. Many were sitting in the warmer conditions, coughing and drinking. Mark caught Jen. "Are they going to be all right?" He asked. Jennifer shrugged. "I don't know." She said honestly. "It's really touch and go. It's been the cold more than the lack of food. They've almost all got bronchitis. I've given them vitamin shots but I dare not given them anything more until they have adapted to the new conditions. I'll have the heat in here raised and try and make them comfortable. But we've got to get back." Mark knew it but he had to see Anne one more, almost certainly for the last time. He nodded to Soogen. "Get the bridge set and pull us out of orbit." He ordered. "I'll be up in just a few minutes." Soogen acknowledged the order silently and moved out with Phil. Then Mark moved quietly to Anne. She was propped up against one of the computer banks. The extra heat emanating from the silicon technology was probably helping. She looked up at Mark as he knelt beside her, this time seeing him. "Mark?" She breathed. Mark nodded. He didn't trust himself to speak yet. He was just holding himself back from holding her close, bursting into tears, declaring his lifelong love for her. As it was her eyes just held him. She looked around her, then coughed. She was clearly not well. "This isn't the medical bay." She noted. "Jen hasn't said much. Where are we?" Mark swallowed. He could play the hero now. This was his chance to take the glory, to make his bid. But there wasn't any point. This was goodbye and she didn't know it. "This is the Galahad." He told her. "It's a Daedalus class. We borrowed it to rescue you." He said flatly. Anne stared at him in disbelief. Then she lent back. "The Federation didn't come for us." She realised, the silence of the weeks suddenly explained. "We signalled and signalled. We didn't know where you'd gone. We thought..." She shook her head then looked up at Mark. "We were abandoned?" Mark had to physically dig his nails into his hand to resist the urge to hold her close right that moment to assure her she would never be abandoned, never again. Another privilege denied to him. "It's a long story." He said. "It's not quite as you think it is. Just rest now. We've got you and we're taking you to another ship ready to get you sorted out. Just rest and get well." Anne tried to laugh and ended up coughing. But, even in the shock and confusion, there was a trace of humour. "You realise," she croaked, "I outrank you." "Not on this ship." Mark retorted. Anne frowned. Mark trusted himself no longer. He stood up. "Get well Lieutenant." He ordered and turned to leave not looking back despite every impulse in him to the contrary. Returning to the Bridge felt like walking to a funeral. If you didn't walk those final steps, if you didn't see the coffin, maybe be it wouldn't be true. He clambered up the ladder to the bridge his mind thinking a hundred times; did they have to surrender? Could they yet out manoeuvre the Eisenhower, make it back to a federation outpost where... he would have to go into hiding. However he calculated it Anne was lost to him. What did prison matter any more? Soogen moved away from the helm. "We're out of orbit." He informed the 'Captain.' Mark nodded and sat slowly. With hands that no longer seemed connected to him Mark punched in the co-ordinates calculated to return them whence they came. Thrusters pushed the starship on it's final voyage, the star moving on screen. There was little left now. This time it would only take a mere half an hour to make their rendez-vous. Mark sat watching the screen blankly. No-one spoke. They knew where they were going, what was awaiting them. He thought he would go with his head held high. As it was he barely had the strength to hold in the tears as his head turned to lead and dropped further down tearing his internal organs apart. There was a blink on the console. Mark glanced at the little green light. He knew what it meant. Computer control. The Galahad was now operating not according to instructions given by the helm but by computer program. He glanced at the navigation settings. No course change. He hit the manual control. Nothing. "Soogen, the computer's lost the helm." He noted. The technician frowned, moving to Phil's console. He tapped at the keyboard. "It's locked out." He noted, not yet panicking in the fashion Mark was. "Is it a malfunction?" Mark checked. "Not at all." Phil said stepping through the bridge hatchway. Mark turned to see the science officer holding a laser. "The system is operating exactly as programmed now please step away from the console." Mark stepped back automatically, his body responding before his brain could take in what was going on. Tired, stressed, he could not respond with speed to the changing circumstances. He glanced at the laser. It was clearly a home built device, knocked up during the journey, attached to a power pack held on his back. Phil had been busy during the journey. "I don't understand." Mark said honestly. "You don't need to." Phil remarked. "Just obey. To the transporter room." "Will take care of itself. Now move!" Mark moved to the transporter room in a daze. They had but minutes until they made it through the fold. He had to think fast. But even adrenalin could not compensate for the exhaustion taking him over. He had risked his life twice already that day by testing the transporter, by risking radiation contamination and oxygen starvation on the planet below. A third try was too much. Still, in the too short journey to the transporter room Mark ran a risk assessment on handling Phil. Nothing came to mind even as Max, was picked up on route. So near and now so far, far away. What was going on? They entered the transporter room. Eyes looked up at them in astonishment, including Anne's. He'd left her never to see her again, his mission all but accomplished. Now he returned ready to lose it and fail it. "Say nothing." Phil ordered. "Mark, Soogen, Max, move over with Jen." "What are you doing?" Jen asked, ignoring Phil's orders. "What's this all about?" "It's about survival." Phil retorted. "The rest of you might be intent on committing yourselves to a life time in prison but I, for one, intent to prosper. Now, just in case any of you have any doubts whether this laser works..." He pointed the weapon at the transporter console. There was no sound, no beam of light. This was not a particle laser like those just entering service in Starfleet. But Soogen's laptop exploded into flame just the same. Mark winched. That completely disabled the transporter. Phil knew what he was doing. Shame Mark didn't. "Phil, please, if you're going to hold us up, can you at least tell us why? We've done nothing to harm you." "No." Phil accepted. "As such I don't intend to harm you. You've saved your precious crew mates. I've done my part to help you. Now just don't try and get in my way. I will shoot if I have to." "But why?" Mark nearly screamed. "You forget, I'm the one holding the gun. I don't need to tell you anything. The ship is on automatic computer control on a preset course. It will take us a few weeks to get there in this crate. I'm afraid you will have to wait here." Phil moved to leave when Mark, almost automatically moved forward. "No." He said, seeing Anne in his head even when she remained behind him. "I won't let you do it." Phil shook his head disbelievingly even as Mark continued. "These people need medical treatment. They need food. They can't wait. We've got to surrender." "Stand back." Phil ordered. "That's an order." "No." Mark replied simply, his obsession driving him on. After all he done to fight for Anne he would not be stopped, not now. He didn't yet have a clue what to do yet but he was not going to let Phil step out that hatch and imprison them. "I don't know what you want but you're not leaving here without the rest of us." "Well that creates a certain dilemma doesn't it?" Phil noted implacably. "Because there is no way I'm going to let you surrender me over to the Federation, not after what they've done. Remember, I'm the one holding the gun." "Then you'll have to use it." Mark retorted. "After all we've been through, I'm not letting you stop us. You want to stop you'll have to fire." He meant it. He had sacrificed too much, far too much already. Phil looked at him, blinked, then fired. Mark's leg gave away underneath him, burning pain engulfing him. In his agony he saw his trouser leg catch fire as the smell of roasting hit him just he crashed to the ground screaming. In an a haze of tearing pain he squirmed putting the small flame out. Others must have moved to help him because he heard Phil call out. "I have had enough of your heroics! No, stay back the rest of you. I've proven I'll shoot. I'll maim first but kill if I have to." There was real anger in his voice now, the control buckling. He heard the venom finally as Phil spat his words at Mark. "And you," He said. "I've had enough of you with your never ending heart rending, your love sick obsession. I thought I'd shut you up with my discovery but, no, you had to put everything on the line for your pretty woman. Even now you can't stop can you? You're mad, you know that, mad!" "And you're being reasonable?" Mark spat through the tears, holding his leg close. Phil looked him in the eye, holding his gaze. "I've lived for reason." He replied. "I pioneered quantum singularity research. I knew the fold was there through my research, my work, stolen by the Federation without rewards, without promotion. For twelve years I've been stuck in service, my work in the hands of petty minded, thieving bearucrats. Now, even as I amass my data you want to put me behind bars." Finally the pieces connected him Mark's mind. The tricorders. Phil's volunteering for the mission. He was researching, amassing data. If the fold was linked to Phil's theory then this venture had been a science mission for Phil. Data to be sold. Mark saw it. Phil was deserting. "They'll find you." Jen warned, speaking what Mark was already thinking. "Not where we're going." Phil responded. There was a pause as this statement sunk in. Mark kept his eye on Phil even as he heard Jen's disbelieving voice. "Not the Tholians? No, the Klingons?! You wouldn't!" Phil's voice was cool now, his iron will back in control. "I will do whatever is necessary. The Klingons will pay handsomely for this data. You should be grateful. I've secured my future and safeguarded yours. Rather than years rotting away in a prison, your promotion prospects shot, just as mine were, you have a chance. And, yes, they do have hospital ships in the Klingon Empire..."
There came a beeping from the transporter console. Mark saw Phil frown. This was something unexpected, or at least untoward. Trying to ignore the pain Mark pushed himself back. His leg was on fire. There was no way he could stand still. He could hardly think, he was nauseous from the pain and the smell. Yet he recognised still the quandary Phil was in. He had to investigate the computer report but could no turn his back on his captives. He nodded Soogen towards the console. "You're expecting me to obey?" Soogen asked. "Don't you start on the heroics. Just read the damn report." Soogen moved past Mark to the transporter console. "The computer's locked out." Soogen informed his captor. "Of course, I programmed it. It'll give you a sensor report, read it." Mark blinked, moving his body very slowly back. "Two metallic objects approaching at... looks like half impulse speed. Looks like we've got company." The report cut through Mark more neatly than the laser. The Romulans were onto them. All their hopes of preventing an intergalactic incident were collapsing. They were going to lose the survey team and start a war. If they were captured and the Romulans got hold of the Galahad's warp engines then warp technology would make the Romulans terrible opponents indeed. The whole Universe was collapsing, such had Mark failed Anne. Suddenly he had to make it right, he had to get to the bridge and stop the madness, stop the collapse and Phil was stopping him. The cost was immaterial now. Adrenalin surged through him once more. He had to get to the bridge. Phil's eyes were on Soogen, peripheral vision on his captives. "Time to intercept?" He asked. Soogen's face was impassive. "Eight minutes forty present speed." And the fold was open to the Romulans for them to enter, giving them a back door to the Federation or a brief encounter with the Eisenhower leading to an inevitable war. Either way they were toast. Mark looked up at Phil, watching him lick his lips. He was worried too. "You've got to let us up to the bridge." Max informed the science officer. "You've got to." Jen implored. "There's a Galaxy at stake here." "I can accelerate without you. Soogen, back with the others." Mark pulled his good leg up. Phil's attention was caught on technician, looking for attack from the most likely routes. In a few seconds Phil would be out of the hatch and they'd be trapped, sardines in a war. Mark turned to look at Anne one last time, feeling that dizzy yearning he always knew around her. He saw her starved shrunken form, her hollow eyes. He could not let her die, not like this, not this way. Roaring emotion, the need to protect overcame him. The years of knowing he would love and lose, the need to do something, something worthy of her attention drove him. He glanced back at Phil, his inner wound burning into him far more than his leg. Phil was still watching Soogen. He had milliseconds. He drove forward, putting the weight on his good leg then leapt at Phil, his leg shearing through him as if the bone would tear through his whole body. He saw Phil's eyes widen in astonishment, his body freezing in shock at this superhuman effort. He fired, but it was too late, Mark was upon him. There was no reason left in Mark when he drove into the science officer. He cared not if he lived or died now. Hatred, rejection by Anne combined by the impossible yearning made him a blind animal determined only to destroy the obstacle before him. He slammed into Phil, both falling to the ground. Yelling with pain and animal passion Mark smashed his fist into Phil's face again and again with all his body weight, just as he had practised smashing Ononogu's face in his Star Base quarters at the news there would be no rescue. Part of Phil's cool brain was still operational, however, even his blood splashed the cold deck as Mark screamed as Phil kicked his leg. The blinding pain sheered through his head, making movement impossible. He felt rough hands grab him. He flailed when he heard, through the pain, "Mark, it's Max. It's all right." Mark blinked, tears of pain running down his cheeks. He saw Phil held by Soogen in a martial arts grip he did not recognise. Mark looked up at the engineering supporting him. The pain in his leg was intolerable. He was slipping, unable to support his own weight. "Help me." He whispered. Jen was beside him. "Sit down." She ordered. "I'll get you seen too." Mark shook his head, even as he clung onto Max for support. "No." He retorted. "The bridge. Got to get to the bridge." "No!" Mark yelled, his voice echoing through the transporter room, pain and exhaustion stealing away the energy to argue his case. He managed to turn to Jen and breath out the word, "The bridge. Later." He promised. He saw Anne move forward towards him weakly even as Jen hesitated. "Mark..." She began. Mark had no energy to cope with the emotional strain of being hear her, even if she meant well. What she planned to say he did not want to hear, not now. They had to get the ship out of there. He turned to Max. "Bridge." He ordered. "Now." In the end Max lifted Mark over his shoulders taking him up to the bridge, Soogen taking his place in engineering, Phil locked up in one of the many empty rooms on the ship. Jen sprayed in a pain killer on route, quickly making the pain bearable, giving Mark time to think. He was dumped into his seat at the helm. Mark eyes scanned the console. One last effort. Now the emotions were passing leaving him cool and calculated just for once. They were trapped in an unsolvable dilemma. If they stayed they were dead. Romulan ships were always armed, one of the few things they had discovered during the Romulan war. If they leapt through space they lead the way for the Romulans to strike near the heart of the Federation. Either way there would be another Romulan war, stay or go. He could only see one way out. It was not an easy option. Max was at the science station. "Strewth." The Australian exclaimed quietly seeing the impossible report. "One minute. They've accelerated way faster than anything we've ever seen in the past." Mark automatically tried to accelerate the ship but the computer system had locked the helm. Damn Phil. Now the Romulans would catch them faster than they could escape. They had seconds left. "Can you bypass the computer?" He asked the engineer, knowing the answer even as he asked the question. "Not without hours of work." Max replied. They were lost. They had no control over the ship, no weapons, even self destruct would take time to instigate. Mark looked up at the empty space hiding the warp in space. The last three weeks flashed through his mind to words he, himself, had spoken. "We can get to the planet via the space fold or whatever it is. Phil is certain that if a Planet can transverse the fold a starship can. The only thing is that we can't use impulse engines or we bend the fold and shoot out in the middle of nowhere, probably in the middle of a giant black hole." He hit the intercom. "Soogen, start Warp count-down." He ordered. "Warp count-down?" Crackled the reply. "It's our only chance. Warp drive will shift the fold, closing it here. The Romulans can't get through, the Federation is safe. It's also our only chance of outrunning them now. Do it." "You realise we may not survive this?" Max pointed out. Mark looked up at the engineer and nodded. "It's that or we die anyway." He replied honestly. "Mark." A voice cut in, quietly. It was Anne, standing at the hatchway, dirty, dishevelled, clearly weak and ill, and still so beautiful. There wasn't time to talk. Mark waved her over. Trained eyes scanned his face and the computer readouts. She could read the mortality of the situation. She moved quietly towards the helm, sitting down besides Mark. She opened her mouth to speak but Mark put this finger to his lips. There wasn't time. Ten seconds to go. He kissed her hand and held it tightly, just for a minute. "Strap yourself in." He ordered. He punched the intercom, all hands. "All hands, hang on. We're going to warp." He glanced back to Anne, belted up. He strapped himself in. After a three week intensive scan of the area, no trace of the Warp anomaly can be located. Probe launches indicate normal space. There has been no trace of the USS Galahad. Given the objectives of the Galahad's 'mission' it is extremely unlikely they would have spent this time in the rescue attempt. The research teams conclusions are unanimous; that the Galahad did not survive the attempt to navigate the warp fold and, in it's destruction, closed the fold, the effect of sealing the rift occurring here days later. We therefore request permission to return to Starbase 6, our mission completed. Starfleet Special Orders Stardate 2351.2 for the Captain's eyes only. Request to return to Starbase 6 accepted. Report to Admiral Ononogu on arrival for debriefing. Discussion of the Eisenhower's mission is prohibited according to Starfleet General orders 219B - Special mission, fifty year rule. Mark's leg hurt. It throbbed. He opened his eyes wearily, wanting to sleep still. He remembered that he had being doing something important. He blinked. He was on a ship. It wasn't the Jefferson. He looked up at the viewscreen. There was light, a strange kind of light.